Coinage of the Capped Bust Quarter commenced in 1815, featuring John Reich’s image of Lady Liberty wearing a "freedman's cap", an ancient Roman symbol worn by newly liberated slaves. Mint records show that 17,800 quarters were made in 1823, most of which were probably melted, leaving the 1823 as one of the rarest of all United States quarters, and a most desirable acquisition to advanced collectors. All 1823 Capped Bust Quarters are made from the same die pair, the obverse characterized by a 3/2 overdate. Numismatic scholars are puzzled by the virtual absence of 1823 quarters in mint state grade. 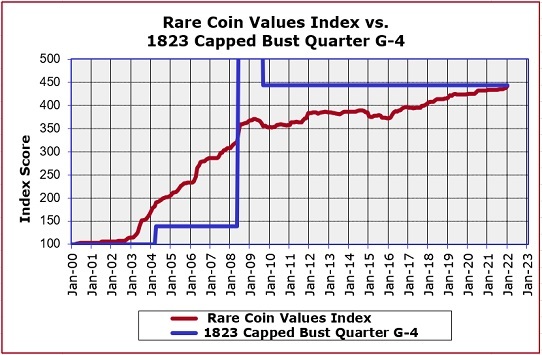 The blue line above depicts the percent value increase since Year 2000 of the 1823 Capped Bust Quarter. The red line graphs the percent gain over the same period of time as the Rare Coin Values Index. The Index is based on the percent gain (or loss) collectively of a carefully selected group of 87 rare US coins. The objective of the Index is to estimate the direction and strength of the overall rare US coin market. The 1823 Capped Bust Quarter is one of the 87 coins selected as a member of the Index. As you can see by comparing the blue line to the red, the 1823 quarter has tremendously outperformed the Index score in recent years. We update the Index monthly.